Paytm Maggi Pazzta Offer, Paytm Pazzta Offer, www.paytm.com/Pazzta, Maggi Pazzta Paytm Cash Offer, Buy Maggi Pazzta and Get Free Rs.15 Paytm Cash – I am here with another Free Paytm Cash loot offer. Today again we back with similar offer. This is Paytm Maggi Pazzta Offer. You will Get Free Rs.15 Paytm Cash on Purchase of Maggi Pazta. This offer is valid for all users. You will get Rs.15 Free Paytm Cash on Every Pack of Pazzta. 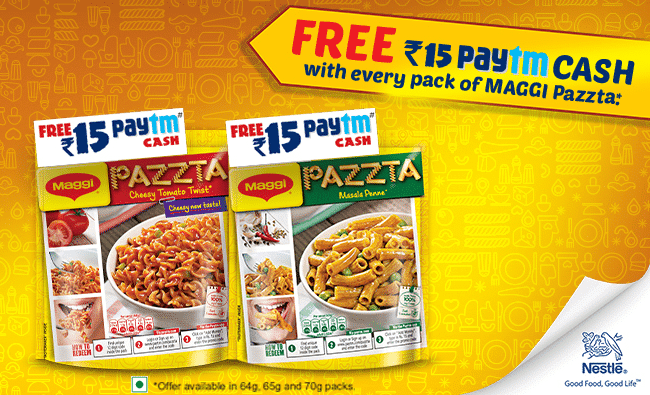 So visit your nearest general store & buy Maggi Pazzta, Enjoy your Pazzta and also get Free Rs.15 Paytm cash. This Paytm Maggi Pazzta Offer is valid in India from 15th August to 15th November 2017. Coupon code can be redeemed till 15th December 2017. So Hurry up and Buy Maggi Pazzta to avail this offer. First Buy Maggi Pazzta from your nearest store (Latest Packet with the Paytm Cash offer). Open pack and enjoy Maggi Pazzta. Get your Paytm cash unique code from inside of pack. Finally you will get Free Rs.15 Paytm cash in your account. You can use this offer 3 times in single account. This Offer is valid in India from 15th Aug 2017 till 30 Nov 2017 (‘Offer Period’) on purchase of Maggi Pazzta Packs referred to as “Products” and on limited stocks only.